We now apply the method of separation of variables to three classes of functions associated with different rates of change. In each of the three cases, we describe the rate of change of a quantity, write the differential equation that follows from the description, then solve—or, in some cases, just give the solution of—the d.e. We list several applications of each case, and present relevant problems involving some of the applications. An interesting special differential equation with wide applications is defined by the following statement: “A positive quantity y increases (or decreases) at a rate that at any time t is proportional to the amount present.” It follows that the quantity y satisfies the d.e. where k > 0 if y is increasing and k < 0 if y is decreasing. tells us that c is the initial amount of y (at time t = 0). 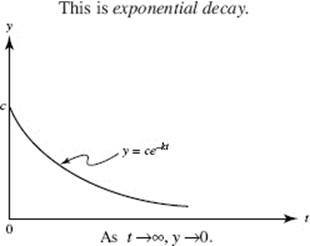 If the quantity grows with time, then k > 0; if it decays (or diminishes, or decomposes), then k < 0. 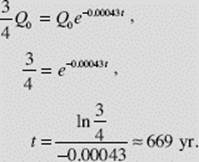 Equation (2) is often referred to as the law of exponential growth or decay. 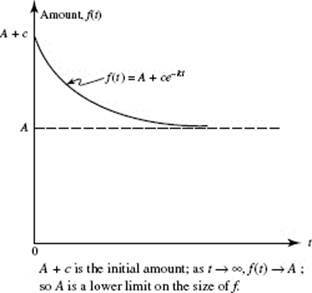 The length of time required for a quantity that is decaying exponentially to be reduced by half is called its half-life. The population of a country is growing at a rate proportional to its population. If the growth rate per year is 4% of the current population, how long will it take for the population to double? The bacteria in a certain culture increase continuously at a rate proportional to the number present. (a) If the number triples in 6 hours, how many will there be in 12 hours? (b) In how many hours will the original number quadruple? hence, C = ln N0. The general solution is then N = N0 ekt, with k still to be determined. N = N0 e(t ln 3)/6. (a) When t = 12, N = N0 e2 ln 3 = N0 eln 32 = N0 eln 9 = 9N0. Radium-226 decays at a rate proportional to the quantity present. Its half-life is 1612 years. How long will it take for one quarter of a given quantity of radium-226 to decay? (1) A colony of bacteria may grow at a rate proportional to its size. (2) Other populations, such as those of humans, rodents, or fruit flies, whose supply of food is unlimited may also grow at a rate proportional to the size of the population. (3) Money invested at interest that is compounded continuously accumulates at a rate proportional to the amount present. The constant of proportionality is the interest rate. (4) The demand for certain precious commodities (gas, oil, electricity, valuable metals) has been growing in recent decades at a rate proportional to the existing demand. (5) Radioactive isotopes, such as uranium-235, strontium-90, iodine-131, and carbon-14, decay at a rate proportional to the amount still present. (6) If P is the present value of a fixed sum of money A due t years from now, where the interest is compounded continuously, then P decreases at a rate proportional to the value of the investment. (7) It is common for the concentration of a drug in the bloodstream to drop at a rate proportional to the existing concentration. (8) As a beam of light passes through murky water or air, its intensity at any depth (or distance) decreases at a rate proportional to the intensity at that depth. At a yearly rate of 5% compounded continuously, how long does it take (to the nearest year) for an investment to triple? One important method of dating fossil remains is to determine what portion of the carbon content of a fossil is the radioactive isotope carbon-14. During life, any organism exchanges carbon with its environment. Upon death this circulation ceases, and the14 C in the organism then decays at a rate proportional to the amount present. The proportionality factor is 0.012% per year. When did an animal die, if an archaeologist determines that only 25% of the original amount of14 C is still present in its fossil remains? (where Q0 is the original amount). We are asked to find t when Q(t) = 0.25Q0. Rounding to the nearest 500 yr, we see that the animal died approximately 11,500yr ago. 3.5 × 109 = P(0) = P0 e0 = P0. P(t) = (3.5 × 109)e0.019t. where it seems reasonable to round off as we have. Thus, if the human population continued to grow at the present rate, there would be one person for every square foot of land in the year 2720. Case II (b) can be solved similarly. (a) What is its temperature after 5 hours? (b) How long will it take for the temperature of the roast to fall to 21°F? 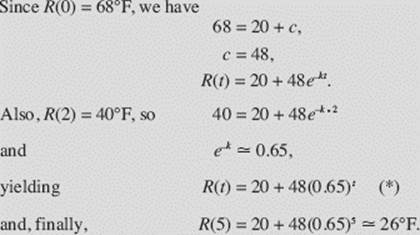 SOLUTIONS: This is an example of Case II (b) (the temperature is decreasing toward the limiting temperature 20°F). Advertisers generally assume that the rate at which people hear about a product is proportional to the number of people who have not yet heard about it. Suppose that the size of a community is 15,000, that to begin with no one has heard about a product, but that after 6 days 1500 people know about it. How long will it take for 2700 people to have heard of it? N(t) = 15,000 − ce−kt. N(t) = 15,000(1 − e−kt ). (1) Newton’s law of heating says that a cold object warms up at a rate proportional to the difference between its temperature and that of its environment. If you put a roast at 68°F into an oven of 400°F, then the temperature at time t is R(t) = 400 − 332e−kt. (2) Because of air friction, the velocity of a falling object approaches a limiting value L (rather than increasing without bound). The acceleration (rate of change of velocity) is proportional to the difference between the limiting velocity and the object’s velocity. If initial velocity is zero, then at time t the object’s velocity V(t) = L(1 − e−kt). (3) If a tire has a small leak, then the air pressure inside drops at a rate proportional to the difference between the inside pressure and the fixed outside pressure O. At time t the inside pressure P(t) = O + ce−kt. where k and A are both positive. 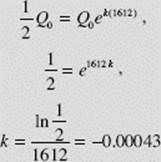 Equation (1) is called the logistic differential equation; it is used to model logistic growth. (3) f (t) → A. 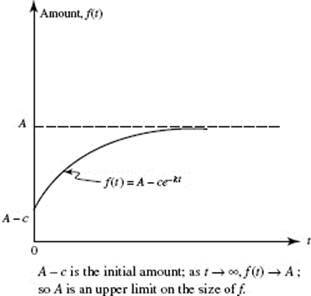 Thus, A is an upper limit of f in this growth model. When applied to populations, A is called the carrying capacity or the maximum sustainable population. 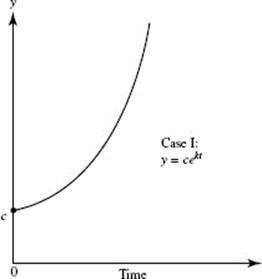 In Figures N9–9a and N9–9b we see the graphs of the growth functions of Cases I and III. 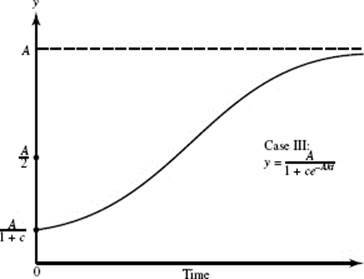 The growth function of Case I is known as the unrestricted (or uninhibited or unchecked) model. It is not a very realistic one for most populations. It is clear, for example, that human populations cannot continue endlessly to grow exponentially. Not only is Earth’s land area fixed, but also there are limited supplies of food, energy, and other natural resources. The growth function in Case III allows for such factors, which serve to check growth. It is therefore referred to as the restricted(or inhibited) model. The two graphs are quite similar close to 0. 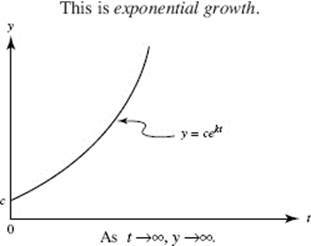 This similarity implies that logistic growth is exponential at the start—a reasonable conclusion, since populations are small at the outset. 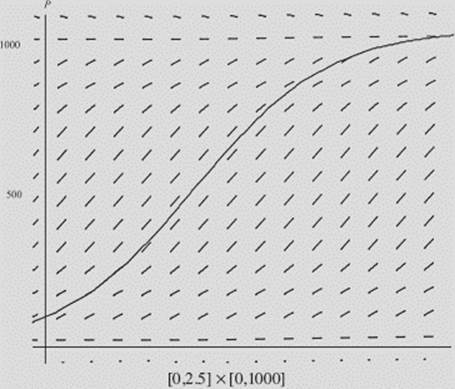 (3) then decreases (y ″ < 0), approaching 0 as y approaches its upper limit. It is not difficult to verify these statements. (2) A rumor (or fad or new religious cult) often spreads through a population P according to the formula in (1), where N(t) is the number of people who have heard the rumor (acquired the fad, converted to the cult), and P − N(t) is the number who have not. (4) Advertisers sometimes assume that sales of a particular product depend on the number of TV commercials for the product and that the rate of increase in sales is proportional both to the existing sales and to the additional sales conjectured as possible. (5) In an autocatalytic reaction a substance changes into a new one at a rate proportional to the product of the amount of the new substance present and the amount of the original substance still unchanged. Because of limited food and space, a squirrel population cannot exceed 1000. It grows at a rate proportional both to the existing population and to the attainable additional population. If there were 100 squirrels 2 years ago, and 1 year ago the population was 400, about how many squirrels are there now? with P(0) = 100 and P(1) = 400. We seek P(2). 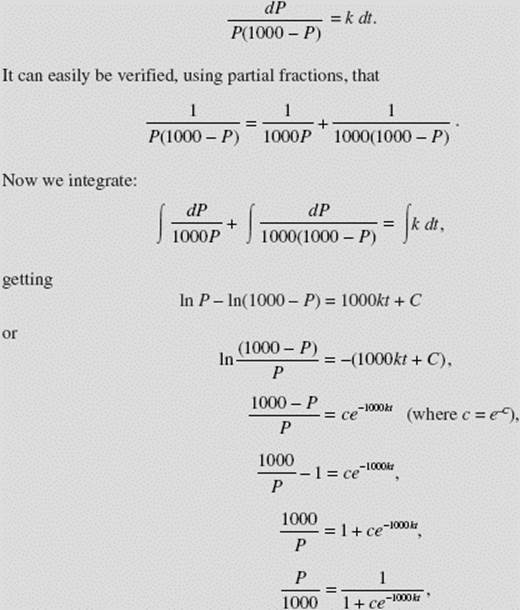 Please note that this is precisely the solution “advertised” in equation (2), with A equal to 1000. Figure N9–10 shows the slope field for equation (3), with k = 0.00179, which was obtained by solving equation (5) above. Note that the slopes are the same along any horizontal line, and that they are close to zero initially, reach a maximum at P = 500, then diminish again as Papproaches its limiting value, 1000. We have superimposed the solution curve for P(t) that we obtained in (6) above. (c) indicate when the virus will be speading the fastest. (c) The virus spreads fastest when 50,000/2 = 25,000 people have been infected. 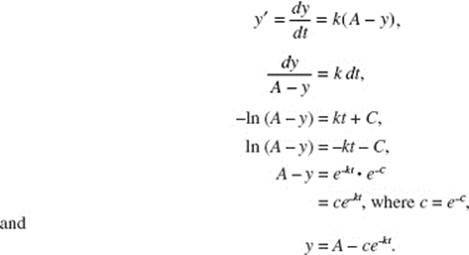 In this chapter, we have considered some simple differential equations and ways to solve them. Our methods have been graphical, numerical, and analytical. Equations that we have solved analytically—by antidifferentiation—have been separable. It is important to realize that, given a first-order differential equation of the type it is the exception, rather than the rule, to be able to find the general solution by analytical methods. Indeed, a great many practical applications lead to d.e.’s for which no explicit algebraic solution exists.